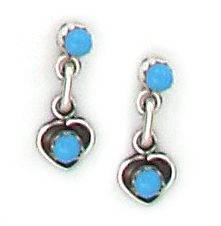 Sterling silver dangle heart earrings with two hand cut approximately 3mm synthetic turquoise stones on each side. They measure about 3/4" long and are about 1/4" wide. Crafted by Zuni artisan Tammy Wyaco. Color shade of turquoise may vary.